Athletes ALWAYS warm-up their muscles before an important performance, DO YOU? A good vocal warm-up is as vital to a singer/speaker as it is to a professional athlete, and a bad warm-up is more harmful to your voice than no warm-up at all. Knowing how to tell a good warm-up from a bad warm-up is vital to your vocal health and your performance. Knowing how to tell a good warm-up from a bad warm-up is vital to your vocal health and your performance. 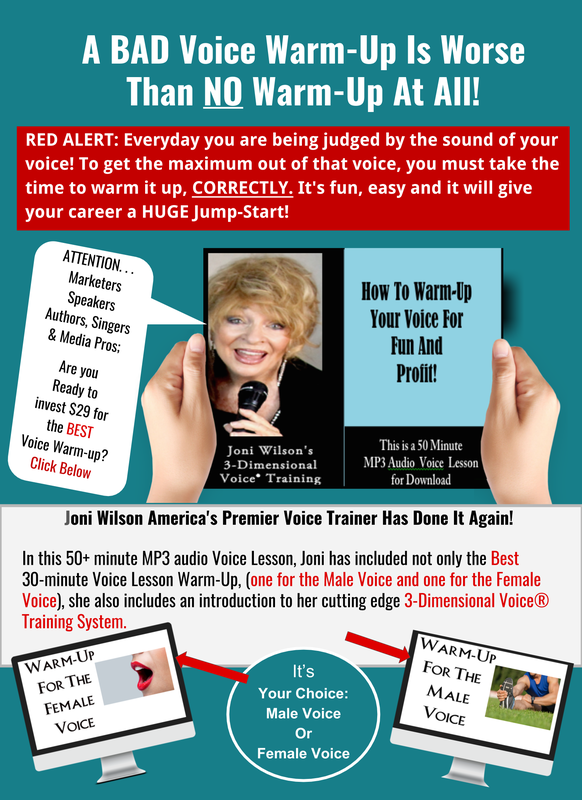 Take good care of your voice by warming it up for success with Joni! Why a warm-up just for men? Because a man's vocal cords are a quarter-of-an-inch longer than a woman's, his voice is lower and fuller. A comfortable vocal warm-up range for a man is on average much lower than a woman's comfort vocal zone. The 2nd part of this audio (at the 28 minute spot, give or take) is the vocal warm-up in the right range for the male voice! Enjoy your warm-up and have fun on those high notes. When you get right down to it, the truth is that a woman's voice, like many other parts of her body, is not as strong as a man's. 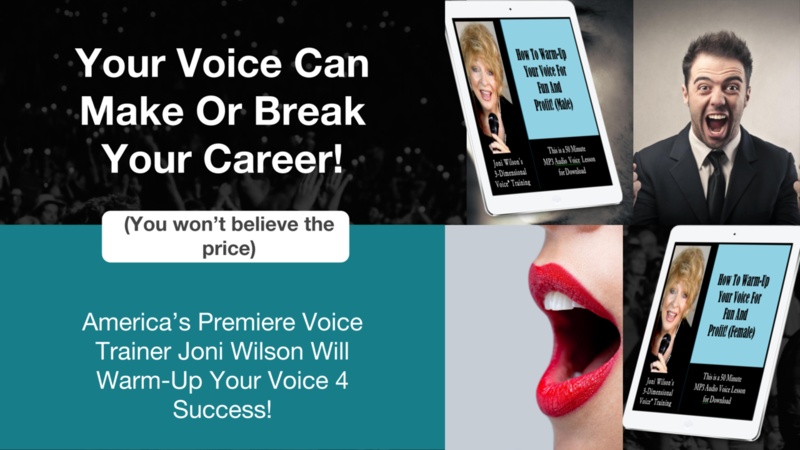 Because of that difference, in this competitive world, where men and woman are running neck and neck for the same jobs, women need to know how to get the most out-of-their-voice without KILLING IT! A good warm-up, just for women is the perfect tool!